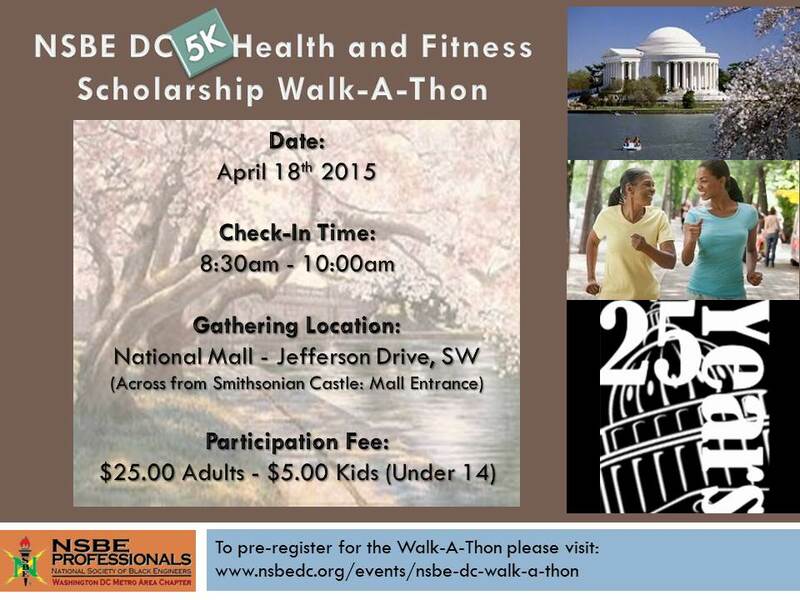 Walk-A-Thon to provide exercise and fitness motivation, camaraderie with fellow NSBE DC members, and raising monies for the NSBE DC Future Innovators Scholarship! The Walk-a-Thon will take place from 8:30am-10:00am. Registration will be available starting Monday, February 9, 2015! Please note, there will be no fees collected on the day of the Walk-a-Thon! Costs are $25.00 for Adults and $ 5.00 for Kids under 14! Stay tuned for additional event information! For questions, please contact the NSBE DC Membership Chair at membership@nsbedc.org.